You’ve heard of town twinning, maybe even of toilet twinning, but have you ever heard of ‘ethnotwinning’? Did you know that every language in the world has a 3 letter ISO639 code? So, as long as you’ve got 3 initials, you can find your own ethnotwin. My initials are DJR and my ethnotwin is a language in Australia called Djambarrpuyngu. My wife Julie ends up as a Macrolanguage in Nigeria — a cluster of languages that used to be considered one language but which has been split up now. How can I find my ethnotwin? The easiest way just now is to go to Ethnologue (say the page for Nigeria’s languages) then look for the handy search box in the top right, and type in your initials. Alternatively take the following url: https://www.ethnofollowing url: https://www.ethnologue.com/language/ and add your initials to the end of it. Perhaps you might want to find out about your ethnotwin language and people. You might notice that quite a lot of languages are in Nigeria, Papua New Guinea and Indonesia. You might notice how much Bible translation and language development there still needs to be done. You get extra points if you actually live in the country of your ethnotwin. Double the points if you manage to go there. If you’d like to feature below, send an email to ethnotwin@m.rowbory.co.uk with your name, ethnotwin and optionally a photo of you in the location where the language is spoken. Sadly Rebekah, Elizabeth and Helen don’t seem to have ethnotwins, but depending on which middle names are included Abigail is twinned with Mapudungun, a language of Chile, or Karo, a language of Brazil. My sister Jo was JRR, a language of Nigeria but sadly with her married name she isn’t twinned with any language. My sister Lydia sadly doesn’t have an ethnotwin for her maiden or married name, but my Mum is twinned with Malavedan, an Indian language and my Dad is twinned with another Indian language, Kharia. 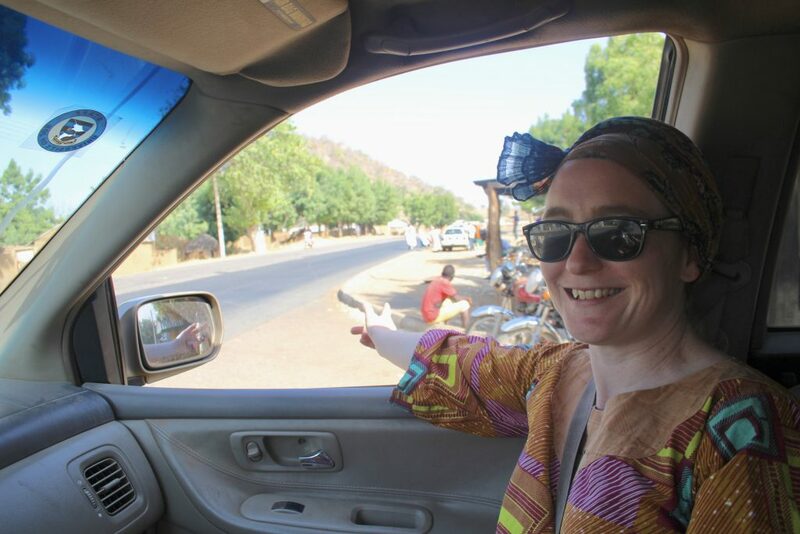 At the junction for Yankari, east of Bauchi Kathleen Kennedy Spence points east towards ‘her’ ethnotwin language, kks (Giiwo) which is spoken perhaps 20-25km further along the Bauchi-Gombe road. Winston Leonard Churchill is ethnotwinned with Comorian, the statutory language of provincial identity in Moheli Island, Comoros.